Designing efficient bidding strategies for sequential auctions represents an important, open problem area in agent-mediated electronic markets. In existing literature, a variety of bidding strategies have been proposed and have been shown to perform with varying degrees of efficiency. However, most of strategies proposed so far do not explicitly model bidders' attitudes towards risk which, in mainstream economic literature, is considered an essential attribute in modeling agent preferences and decision making under uncertainty. 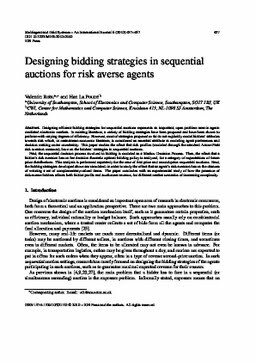 This paper studies the effect that risk profiles (modeled through the standard Arrow-Pratt risk aversion measure), have on the bidders' strategies in sequential auctions. First, the sequential decision process involved in bidding is modeled as a Markov Decision Process. Then, the effect that a bidder's risk aversion has on her decision theoretic optimal bidding policy is analyzed, for a category of expectations of future price distributions. This analysis is performed separately for the case of first price and second-price sequential auctions. Next, the bidding strategies developed above are simulated, in order to study the effect that an agent's risk aversion has on the chances of winning a set of complementary-valued items. The paper concludes with an experimental study of how the presence of risk-averse bidders affects both bidder profits and auctioneer revenue, for different market scenarios of increasing complexity.